5.16.14 We have several upcoming workshops this summer. Please check out our upcoming events page for more information. http://edprodevelopment.com/upcoming-events/ 5.9.14 Week 4 Story Telling is a great way for students to demonstrate their understanding of specific meanings and appropriate uses of terms/vocabulary. Teachers should model the strategy by using 2-3 of the terms and weaving them into a story. Students need to make sure they are using the terms appropriately in their story, not just mentioning them. Generate a list of terms for students to use to create a story. Model a sample story or an excerpt that demonstrates how to the terms are used in a narrative. Encourage students to be creative and choose a topic or genre that is meaningful to them. Stories can be wacky or serious. Stories can be any length as long as all words are used correctly. Example excerpt from Math Tools, (Silver, Brunsting, and Walsh, 2008): Math vs. Social Studies Sequence finite infinite…. There are a lot of sequences in school. There are sequences of dates to remember in social studies. Sequences in social studies are finite since they start at one time or place and end in another. In mathematics, there can be finite sequences like all the integers between 0 and 10 and infinite sequences like all of the integers greater than 0. When working with sequences….. Bump is a great way to get a lot of practice in, maybe even from a worksheet or study guide, but without the tedium of the worksheet itself. Provide each student a bubble answer sheet (or have them number their paper before beginning). Place numbered questions around the room on desk tops. Designate the pattern to follow through the room. Have all students stand in front of a desk and locate the question number they are looking at on their answer sheet. Give students a designated amount of time to solve/answer the question and record their answer. 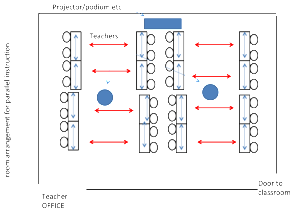 Call out “BUMP” (or other term of your choice) and each student moves to the next desk to answer the question. Continue until time is up or all students have been to each question. Option: Students may work in pairs or small groups to come up with answers and record or separate or shared answer sheets. 5.2.14 Week 3 Three Way Tie, is a triangle organizer that connects three separate but related terms (Silver, Brunsting, and Walsh, 2008). It forces students to get right to the heart of the information using a few critical words. Identify a concept for review. Connect the concept with two other teams and place on the Three-Way Tie Organizer. Along each side of the triangle, the student writes a sentence that relates the two connected terms. Students use the three sentences to develop on summative sentence that is written in the middle of the triangle. Have students share and explain what they wrote in pairs, small groups or with whole class. Rotating Review is a cooperative structure in which students move around the room in small groups adding to information left by previous group. 1. Topics are written on pieces of chart paper and posted around the room. 2. Each team is given a marker. 3. Designate teams to go to one of the papers. 4. Team is given one minute to write on the paper about the specific topic. 5. Time is called and teams rotate to another piece of paper. 6. Teams are given one minute to read what was written by the previous team. 7. Teams put a question mark next to anything they have a question on or disagree. 8. Team has an additional minute (or 30 seconds) to write any other information. 9. Repeat steps 4-8 until all teams have rotated to each piece of paper. When every group has been to every question go over all of the answers with the whole class asking for explanations for anything that is not obvious. 4.25.14 Week 2 Fist Lists and Spiders, as Silver, Brunsting, and Walsh (2008) coined them, are visual organizers that help students make connections between ideas, terms etc. and their definitions. These mapping tools are either an outline of a hand or an eight legged spider that students can draw themselves or can be provided for them. The hand allows for 5 concepts related to the word or concept while the spider provides space for 8 concepts. Identify the concept or term. Provide students with the organizer or have them draw it. Have students write the concept or term in the center of the organizer. Give students think time to generate ideas related to concept or term. Have students write their best 5 or 8 ideas, depending on which map used. Have students share, with partner, in small group or with class, their ideas and how they made those connections. Inside/Outside Circle is a cooperative learning structure that has the entire class working in pairs that rotate after each question. The teacher gives each student a note card with a question on the outside and the answer on the inside/back. Students stand in two concentric circles, inside circle facing out, outside circle facing in. Students face a partner, and the teacher calls, “inside” or “outside” to let students know who should ask/present their question first. Students praise or correct each other. The teacher directs either the inside or the outside circle to turn to the left or right, and then tells them to move “x” number of spaces. 4.18.14 As we approach the season fondly referred to as “TCAP Season” we want to share weekly ideas for test review. Both teachers and students can quickly grow tired of the “same old review sheets”. In an effort to spice things up a bit we are going to share some vocabulary and cocept building tools, as we all know that test taking is greatly dependent on knowing the vocabulary in the directions as well as in the questions and answers. We are also going to share four cooperative learning strategies that can be used with any content. Good luck with test prep and hope the actual assessment results exceed everyone’s expectations. Knowledge Cards Research suggests that to teach vocabulary effectively requires students to (a) form a strong initial connection with the term (Connect), (b) understand how the term relates to one another to fit together to make up a larger structure (Organize), (c) use thinking strategies and multiple forms of representation to develop a deep, conceptual understanding of the most important vocabulary terms. (Deep Process) and (d) engage in meaningful review and practice activities that help commit new terms to their long-term memory (Exercise). (cited from Silver, Strong, &Perini (2005) in Silver, Dewing, and Perini (2012). The Core Six. Essential Strategies for Achieving Excellence with the Common Core. Alexandria, VA: ASCD, page 67). Knowledge cards are used to support student learning of new vocabulary by assisting students to “connect” with the term and to “organize” the term. In addition, construction and use of knowledge cards cuts across several “intelligences” (c.f., Gardner, 1984), such as linguistic, spatial, bodily kinesthetic, intrapersonal, and, if used in partner activities, interpersonal intelligences. As such, it has wide appeal to a number of students’ learning preferences at some point in the construction and/or use. Each card is to hold one vocabulary word. Students are required to write the formal definition, write a definition in her/his own words, write a sentence containing the word, and create a picture to help remember the meaning of the word. Cooperative learning is an excellent way to engage all students at one time in a classroom. Using cooperative learning to review for tests is a good way to get a “feel” of your students understanding of the subject matter as you circulate around the room listening to them interact with one another. Below is one of four cooperative learning structures we are sharing to assist with preparation for the TCAP and EoCs. Guess the Fib 1. Teams must tell three outrageous truths and one fib about subject matter. 2. Teams discuss and determine each member’s role (who is going to tell the truth and who will tell the fib). 3. Each team stands and presents their truths and fib to the class. 4. Class tries to determine who is telling the fib on each team. Think about what you do to ensure that all students know they are valued…appreciate the differences they bring to the table. Please leave us a comment about what you do. Can you name one or more students who may not feel that they belong/are a part of the class and/or school? Opportunities to experience natural outcomes. Yes, we must teach these too, no matter what grade/level we teach. Give “paths” of movements to decrease disruption. Practice in natural contexts. Teach. Give students time limits to transition quickly. Have races to see how fast groups can move quietly. If centers, have students leave centers with something in writing. Scaffold the steps – When I say, 1, stand and push in your chairs. When I say, 2, turn and face the door, …. 9. Establish a respectful, caring classroom. 7. Establish clean and predictable student & teacher procedures. Rules are values that set expectations for student behavior. Procedures tell students how to perform routine instructional and housekeeping tasks. Show me SLANT. Make sure you are SLANTing. Present clearly in an orderly, “step x step” manner. Provide practice time in natural contexts. Review & re-teach as necessary. Apply consequences for correct and “error” responses. 8. Teach and actively supervise smooth transitions. Learning IS Social … or least it should be! Hand up, stop talking and doing. Signal others. Look. Listen. When I say ___, you say___. Establish a “Asking for Help” rule, e.g., if working in team, must ask team members first, then another team before asking teacher. 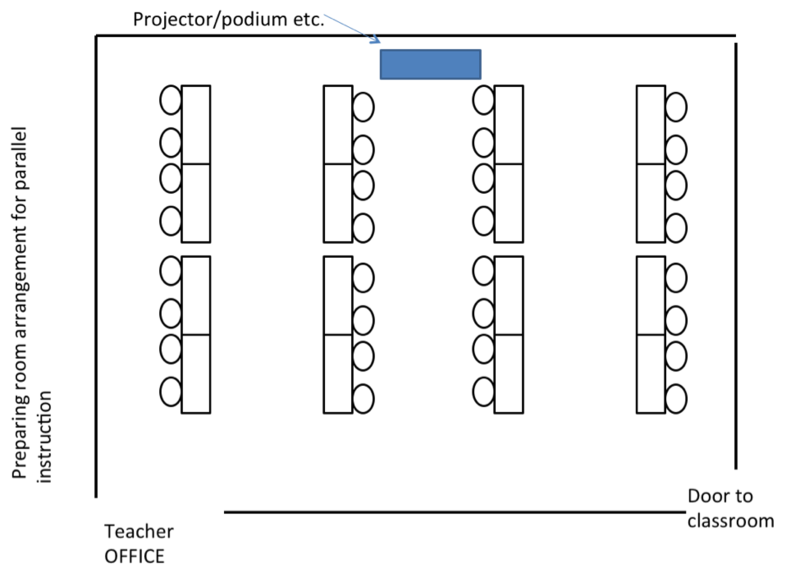 Distribute materials in groups – to the student at the end of each row or to each table. Identify a materials distributor and materials collector as a class role. Make sure students have space to keep materials they have yet to complete. Students can be great for re-distributing furniture as long as they are explicitly taught to do so. 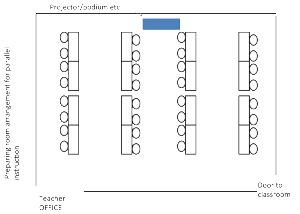 Use in class personal folders marked with student name, class period/time, and seating area. Use color codes. How do I maintain an acceptable level of buzz in the classroom? 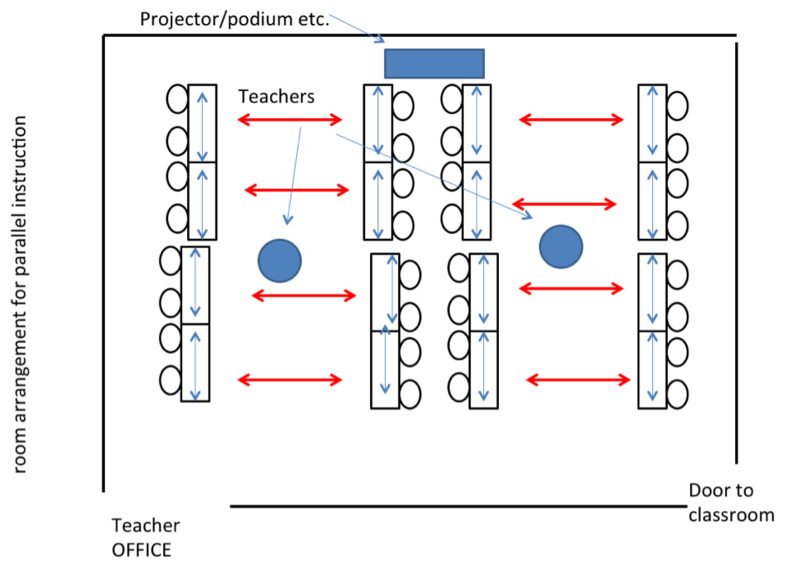 Provide and use signals for noise reduction. Teach students to monitor noise levels and adjust. What do I do about students who need quiet to work? You have control over how your classroom is arranged. Research shows that effective classroom arrangement maximizes student learning by contributing to good classroom management and supporting effective instruction (Evertson, 1993, 1004). Have clear lines of vision to all students. Ensure students can see the black/white board and instructional displays. Position group stations/work stations to minimize distractions between groups. Seat students with sensory challenges such that you maximize their engagement in instructional activities. Be aware of action zones. Attend to room temperature, noise level, lighting, color. Provide each student his/her personal space for belongings. I will always be fair, and I won’t always treat everyone the same. Treat minor infractions as an error in learning and correct the error. Be calm and use a “matter of fact” tone of voice when giving your consequence. Simply state the rule and consequence. Redirect when early problem “indicators” occur. Be aware of the “power of proximity”. Avoid “hooks” to power struggles. Keep your sense of perspective and humor. When you do not get 100%, the goal is to limit public attention for undesired behavior and focus on desired behavior. Do not scold or chastise. Lemov, D. (2010). Teach Like a Champion. 49 Techniques that put students on the right path to college. Jossey-Bass, San Francisco, CA. Don’t embarrass the student in front of peers. Refuse to engage in disciplinary conversation across the room. Remember PEP. Some teachers have “it”: they enter a room and they are instantly in command. Below are five techniques anyone can you. Mastering these skills may not make you the “it” teacher, but having a Strong Voice will surely get you a lot closer. 3. Use effective consequences to rule following behavior. 2. TEACH behavioral expectation for rules. Identify and explain rule and its behavioral expectations. Post rules with pictures and in other languages, when appropriate. 100 percent compliance – if you ask, they should all do it. Achieving compliance is an exercise in purpose, not power. Sequence is complete. The moment when you circle back and ask the student to reanswer the original question is the No Opt Out. As teachers, we are the defenders of right answers. In our quest to hold out for what is right, there are four categories within Right is Right. 2. Answer the question. If you’re a Right is Right teacher, you know that the “right” answer to any question other than the one you asked is wrong. 3. Right answer, right time. Protect the integrity of your lesson by not jumping ahead to engage an exciting “right” answer at the wrong time. 4. Use technical vocabulary. Technical vocabulary expands the students’ vocabularies and build comfort with terms students will need when they compete in college. Use Format Matters to prepare your students to succeed by requiring complete sentences and proficient grammar every chance you get. Self Assessment—Are your rules & expectations . . .
s Use materials and equipment as designed. Classroom Management is … All the things that a teacher does to organize students, space, time, and materials so that instruction in content and student learning can take place. (Wong & Wong, 1998). It is essential teachers employ both effective classroom management strategies AND research-validated instructional practices to support all students to achieve at high levels. Without effective classroom management, effects of sound instructional practices are thwarted. Each Friday for the next 11 weeks, the approaches to effective classroom management (below) will be the topics for discussion. We want this blog to be a collaboration, and as such, please share your insights and experiences, ask questions, and share your resources or just reach out and say hello. We look forward to a rich, full discussion! The EdPro Development Team 10.4.13 – EdPro Development, Inc. read the book Teach Like A Champion, 49 Techniques that Put Students on the Path to College by Doug Lemov (2010). Our initial reaction was, “Wow! Can’t wait to share all 49 techniques with our schools!” The book is set up in two parts: (a) “The Essential Techniques” and (b) “Helping Students get the Most out of Reading” and includes a DV with demonstrations of the 49 techniques by teachers. Chapters 1-7 give details on the 49 techniques referenced in the title. The 49 techniques are organized by similarity and include the following descriptors: Setting High Academic Expectations, Planning that Ensures Academic Achievement, Structuring and Delivering You Lessons, Engaging Students in Your Lessons, Creating a Strong Classroom Culture, Setting and Maintaining High Behavioral Expectations, and Building Character and Trust. Mr. Lemov skillfully captured practices by effective teachers focusing on academic achievement as well and the culture of the classroom and the behavior needed for success in a classroom. Chapters 8-9 give 14 additional techniques and are entitled, “Improving your Pacing: Additional Techniques for Creating a Positive Rhythm in the Classroom” and “Challenging Students to Think Critically: Additional Techniques for Questioning and Responding to Students.” In discussing the book, the team at EdPro Development found techniques they had used in the classroom, ideas they had never thought of and strategies they loved and did not love. The culminating statement made by the team at EdPro Development was that every teacher should have access to this book and its techniques and opportunities to implement them. Part Two of the book began with a bang, but for the EdPro Development team fizzled. Chapter 10, “How All Teachers Can (and Must) Be Reading Teachers” underscores the critical need to “teach students to unlock the full meaning of the texts they read” as being, “the single most powerful outcome a teacher can foster.” Chapter 10 is essentially a 12 page discourse to believers on what is most important in teaching, whether working with 7 or 17 years olds. It is the consensus of the EdPro Development team that Mr. Lemov should have stopped at chapter 10, challenging all of us to focus our instruction around reading. We realized this after plowing on through 11 and 12, where Mr. Lemov gave strategies for being an effective reading teacher. We believe the information Mr. Lemov tried covered in those chapters is best left to the likes of Marie Clay, Fountas & Pinnell, Maire Carbo, Patricia Cunningham, Mary Howard, Patterson and the many other experts in reading instruction Kindergarten through Grade 12. In closing, Teach Like A Champion is a must have for any teacher, whether just beginning his/her career or an accomplished veteran. It is in an invaluable tool for the teacher evaluator in that it gives pictures of what one should see and hear when visiting effective classrooms. Instructional coaches will benefit from this resource as well by using the techniques to provide suggestions and ideas in the face of just about any situation one might encounter in the classroom or in reflection. EdPro Development, Inc. highly recommends Teach Like A Champion. 9.26.13 – We are EdPro Development, Inc.; the only nonprofit corporation in Tennessee formed for the sole purpose of serving schools and school districts through data-driven, quality, ongoing professional development services. Our mission is to provide the educational community with quality, research-driven and affordable professional development with passion and integrity, that results in each and every student being empowered, equipped, and excited to learn. Our professional development provides individually tailored supports when and as long as needed. With over 25 years of experience serving Tennessee, the EdPro Development team has a proven record of offering schools and school districts effective and cost efficient professional development. What do we want to accomplish and what can you expect? We hope that through this online community, this blog will become a collaborative resource to expand your tool kit. We hope you join in and share your insights and experiences. The EdPro Development team continually reviews current literature to increase our knowledge of educational strategies. We will share those book reviews with you as well as suggest books and periodicals that we have found to be interesting and useful. We will also bring to you relevant news from the national and local fronts affecting education. We will let you know what we are hearing in classrooms across Tennessee and pass along helpful tips and ideas we gather from our collective experiences working with educators. Other topics open for discussion are Classroom Management, Differentiated Instruction, Collaboration and Co-Teaching and School-wide Positive Behavior Support. We will share with you links to websites and organizations that provide tools to add to your repertoire and hope that you will share your links with us as well. And last, but certainly not least, we will host guest bloggers–authors, speakers, national and state-wide experts. Together we can achieve more than individually. We want this blog to be a collaboration, and as such, we want you to always feel free to share your insights, ask questions, and share your resources or just reach out and say hello.